If you are an instructor or school owner – you can affiliate your school with our SAMICS Headquarters in Austria and be connected with accredited SAMICS partners worldwide. There are a three types of affiliation to SAMI Combat Systems possible – Instructor, Training Center and Academy. Instructors are authorised to teach students, Training Centers are authorized to teach and grade students and SAMICS Academies are further authorized to teach and grade candidate instructors. 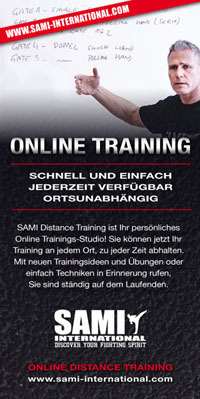 Once affiliated to SAMI Combat Systems and on completion of the relevant licensing agreement you will be listed as an Instructor or Training Center or Academy on our SAMI International platform https://sami-international.com Here you will also be able to access additional SAMI Combat Systems teaching aids, SAMICS system documentation, marketing materials and collaterals. Further, all recognised affiliates will be eligible to use our SAMI Combat Systems designations, logos and branding. There is no affiliation fee as such to become a SAMI Instructor (first level of affiliation) in the SAMI Combat Systems network however it is mandatory that all affiliates have an active SAMI International membership as a certified SAMICS Instructor, currently € 90.00 [ninety Euros] per annum (status July 2017). N.B. The prerequisite for all affiliates is instructor training!